Just as it’s impossible to make money at a brick-and-mortar store when the front door is closed, a website down spells doom for its owner. What if the glitch lasts just a couple of minutes? Ask yourself how many people you see waiting around those “be back in 10” signs. (Only bureaucrats and doctors can get away with making people wait). Don’t risk your business by letting even a minor problem give your customers an excuse to go elsewhere. 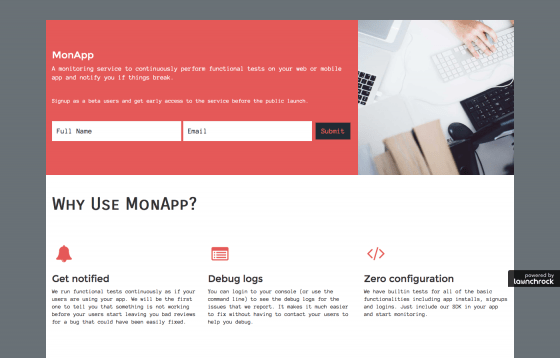 MonApp is a website monitoring service that runs checks continuously on your websites or mobile apps and notifies you if anything isn’t functioning properly. Now, there are quite a few website monitoring services online. Plenty of them boast about the frequency of their monitoring. Why choose MonApp? For starters, they monitor continuously. Not frequently, but all the time. Round the clock vigilance is the only way to rest comfortably, right? Of course. MonApp tells you immediately when something is awry, so that you find out before you sit down to your morning coffee and discover problems from reading bad reviews. The app also wisely equips owners with debug logs, which allows them to resolve problems without contacting users first. There’s no sense in drawing undesirable attention to your hiccups and damaging trust when doing so is entirely avoidable. With MonApp, you can resolve issues before they turn into public problems – and there’s zero configuration required to enlist MonApp’s help with monitoring your babies. With protection that easy to come by, there’s no excuse for not staying on top of your app’s performance. App installs, signups, logins… Even your most basic online business has several points where malfunctions can drive away users. MonApp tests them all, so you have the peace of mind that no corner has gone unchecked. To get started with MonApp, all that’s required of you is to include their SDK in your app or site. MonApp covers both iOS and Android software. They’re currently signing up beta users for early access prior to launch. Spare yourself the ritual heartburn and anxiety that accompanies code updates. Instead of worrying about breaks, put MonApp on watch detail. Keep your front door open for business, your app running flawlessly in your users’ eyes.